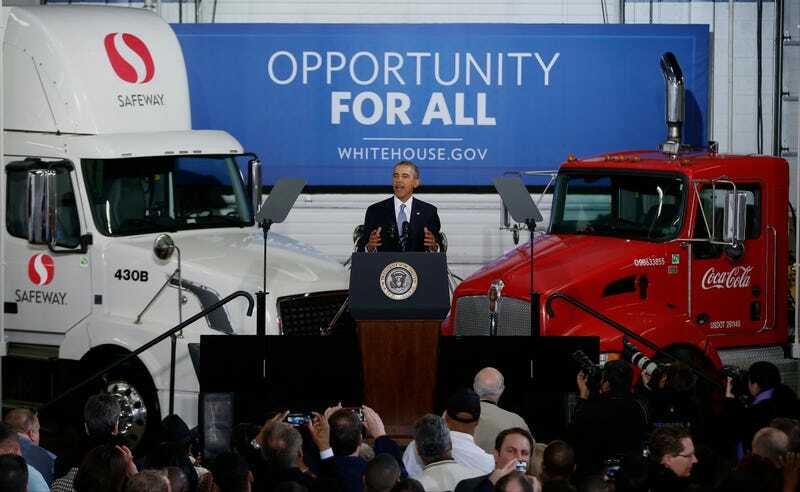 President Barack Obama delivered an address today at a Safeway grocery distribution center in Upper Marlborough, Maryland describing what he wants from future commercial trucks. The venue was chosen because Safeway was "an early leader" in improving commercial fleet fuel economy. Obama praised the grocery store chain for fitting aerodynamic modifications, larger trailers, and more efficient tires to their transport trucks. "If it can be done here, it can be done all across America." He also mentioned he "has a soft spot for Safeway" as his grandma often sent him there in his Hawaiian high school days. The President first started making noise about setting new standards for trucks in 2011, but is now keen to have a firm plan proposed by March 2015 and something in action a year after that, applying to model year 2018 trucks. Obama began his speech by reminding everyone about the environmental and transportation initiatives he discussed in his last State of the Union Address, and proudly proclaimed "for the first time in nearly 20 years, America [now] produces more oil than we get from other countries." He also said he still expects American automakers to "double the distance our cars and light trucks can go on a gallon of gas by 2025," claiming that would "save the typical family more than $8,000 at the pump over time," and cut American oil consumption by 12 billion barrels annually. Once he got into commercial trucks, which he referred to as "heavy duty," he articulated why they matter; "Heavy duty trucks account for 4% of all the vehicles on the highway, but they're responsible for about 20% of pollution in the transportation sector." He also said those trucks own about 20% of our on-road fuel consumption while hauling 70% of domestic freight. Secretary of the Department Of Transportation Anthony Fox and EPA Administrator Gina McCarthy will collaborate with commercial truck manufacturers, operators, and users to "set new standards of 'heavy duty' trucks," said Obama. Theirs would be the proposal he's expecting by next March. He also announced that tax credits will be offered to companies companies contributing to the "alternative fuel infrastructure" for commercial vehicles such as biodiesel and CNG as well as heavy duty truck and parts manufacturers. We'll be staying tuned to the DOT and EPA for updates on the "March 2015 Commercial Truck Proposal" and keep you posted.